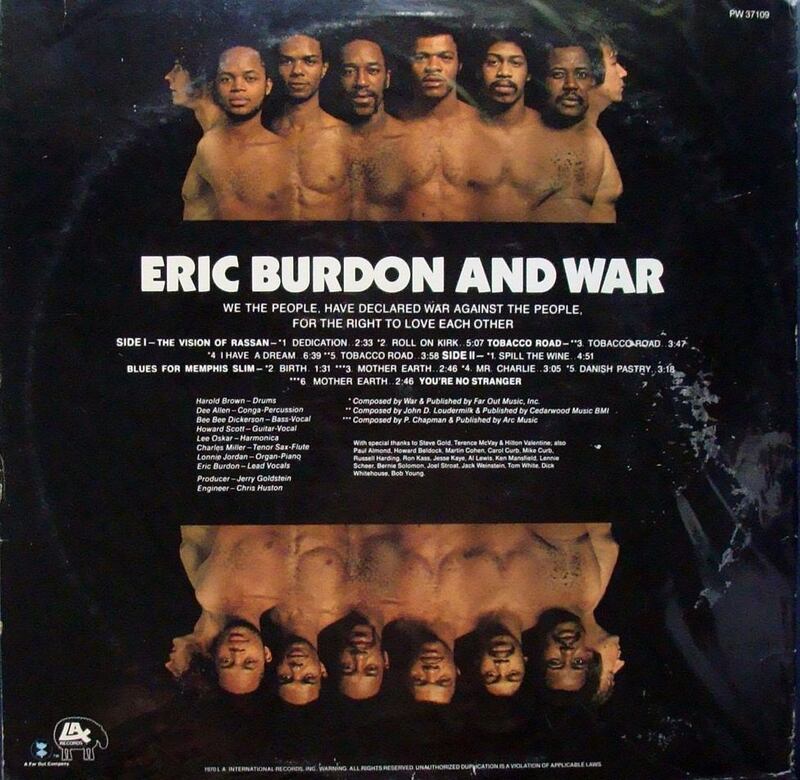 « Spill the Wine » is a 1970 song performed by Eric Burdon and War. Released as a single in May 1970 (backed by the non-album track « Magic Mountain »), it was War’s first chart hit, peaking at number three in the US. Billboard ranked the record as the No. 20 song of 1970. It was also a top three hit in Canada and Australia. It charted #15 in Netherlands and #28 in Germany. In 1996, it was remixed by Junior Vasquez and released as a single again. Lonnie Jordan said in an 2008 interview that Eric Burdon is the first Latin rapper in pop music. The single version omits the middle spoken recitation, plus one Chorus. A sound of a French woman is heard in the background. A flute solo also dominates the song. In the introduction to the live version of the song on Greatest Hits Live, Lonnie Jordan reveals that the inspiration for the song was a time when he spilled a glass of wine on a mixing board in the recording studio. Eric Burdon found the event funny, so he and Jordan used it as the inspiration for the song. « Spill the Wine » was used in the popular motion pictures Boogie Nights, Deuce Bigalow: Male Gigolo and Remember the Titans. It was also sung during the The Fresh Prince of Bel-Air episode, « That’s No Lady, That’s My Cousin ». The song can also be heard in the Dexter episode « A Horse of a Different Color », while main characters Joey Quinn and Angel Batista are smoking a joint.The song has been covered by The Isley Brothers for their 1971 album Givin’ It All Back, as well as by The B-Side Players, Juan Ma y su Sonido Costeño, 2NU on their 1989 album Ponderous, Lalo Schifrin, Melvin Sparks, Michael Hutchence, The Dream Syndicate, Lighter Shade of Brown, Los Mocosos and Freaked Out Flower Children. In 2004, flautist Alexander Zonjic performed a cover for his album « Seldom Blues. » In 2012, the revival of the 1970s band The L.A. Carpool, covered Spill the Wine with a Latin salsa flare. The cover features well known Latin drummer Richie « Gajate » Garcia among many other well known Latin musicians. Released in 2009, San Francisco band Vinyl covered Spill the Wine on their album Frogshack Music Volume II. The track featured Sugar Pie DeSlanto and Marcus Scott. On October 31, 2013, noted jam band Widespread Panic covered the song, opening the second set of their show at UNO arena in New Orleans and again at Phillip’s Arena in Atlanta, Georgia on New Year’s Eve of 2013. On February 23, 2014, Bruce Springsteen opened his concert at the Hope Estate Winery in the Hunter Valley of NSW, Australia, with a nine-minute version of the song. It was the world premiere of a Bruce Springsteen and the E Street Band version.